What they uncover together is a shocking secret that has been kept safe for more than seventy years. Now the entire family's happiness is at stake – or does the truth about the past hold a valuable lesson for the future? From the internationally acclaimed and award-winning romance writer Barbara Hannay comes this breathtaking novel about finding love against all the odds. It will have you smiling – and crying – from beginning to end. I enjoyed the now and then and thought the transition was expertly done. The historical aspect and love stories were very well presented. My first page flicking experience thoroughly enjoyed. I couldn't put this book down. Since reading this book I have read the rest of the series. Very enjoyable. Lovely stories. Enjoyed all the characters and the interwoven story lines. An outback romance novel written to a formula? Maybe. Characters fit their assigned roles – tall handsome heroes, beautiful delicate heroines. They carry baggage from their pasts and face moral dilemmas. How this is done is revealed in the author’s plot, research and writing. I have met Barbara Hannay and read one of her Mills & Boon books. The Mills & Boon fitted a formula, which has carried over into Moonlight Plains, but because this is a full length novel required to meet the publisher’s contract, the book labours on unnecessarily so. The young ‘grieving’ widow, photo journalist Sally Piper and Luke Fairburn, builder and cattleman, hit it off in a one night stand that threatens to disrupt their rather staid positions, placing them in a situation where society and families and their known and unknown histories influence their judgements. Moonlight Plains is a homestead and small cattle property near Charters Towers, falling into ruin and being renovated by Luke. The finding of a silver dollar under the house reminds the reader of the situation in 1942 when two US airmen crash-land their fighter planes, one of them eventually to die at the homestead, rescued by Boston blue blood Captain Ed Langley and Kitty Mathieson, who was alone on the property at the time. Kitty is still alive in 2013. And so we have parallel affairs, each with its heart rending regrets, missed opportunities and possible hopeful solutions. A double Mills & Boon, and more. The author has to work to make the length. But this is unfair. Wartime in Townsville and Magnetic Island are real, and so are contemporary geographic locations. Hannay has done her research, and made a movie-rich work of art. Despite the twee: ‘ grainy shadow of his jaw’, ‘ broad shoulders and muscular biceps’ (p114); ‘too much sizzle in the air. Too many memories of that night in his swag.’ (p115), the book is not to be put down. Solutions to the moral and historical problems will be found and secrets partially or wholly revealed. When renovated Moonlight Plains is opened up to a family reunion, including a visit from Ed’s daughter Laura, the scene is set for some difficult family matters to be discussed and resolved. This is mainly Luke’s problem, while Sally beavers on with her camera in hand, also assisting with the catering. There is a hiatus when grandmother Kitty and her eldest son meet the American. Resolution is not clear cut. Luke goes off to the bush on a building contract and Sally pines for a man who she foolishly felt she had to give up. Will there be a reunion and happy ever after? Sales depend on a romantic resolution. If the author, in an independent break on her own, was to write her next novel free of formulaic genre restraints, how good would that be? Her writing is lucid and to the point. Her feeling for characters challenged, her plot necessitating careful planning. Relying on letters that were never delivered is possibly too much to ask of a reader of classics or so-called literary novels. I have a feeling that if Barbara Hannay let loose, something greater than slightly flawed and redeemable perfect couples, moonlit plains, wavering coconuts and coral strewn beaches would result. Ed Langley: “’I’ve found that the most unlikely people have the qualities I most admire,’ he said quietly. ‘Not cleverness or wealth or authority, but things like tolerance, kindness, courage…’” (p167). The author is real. If Barbara Hannay develops a major Aboriginal character or characters in her next book on settler societies (for that’s what Australian rural romances depend on), she will stretch the tolerance and imagination of some readers. And that’s what could make her a great writer. Five stars as a romance novel and entertaining story, three stars for its literary merit. Another gorgeous Barbara Hannay story. 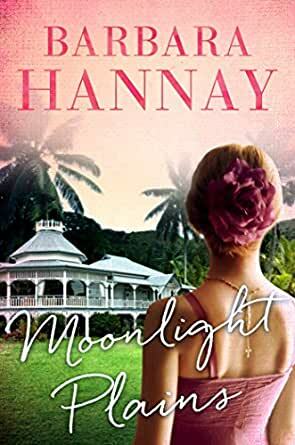 I loved the scale and complexity of Moonlight Plains - not only a present day romance, but the unravelling of a WWII romance as well, a romance that survived decades and different lives. There was a poignancy in the older romance that resonated with me - that you could share a deep and abiding love, while forging different lives was unexpectedly powerful.